The Google Webmaster Tools site has been around for quite a while, offering a wide array of information to help website owners manage and track google specific information for all websites the owner may have published. These services include crawl errors, popular google keywords, external and internal links, crawl rates, sitemap information, and more. 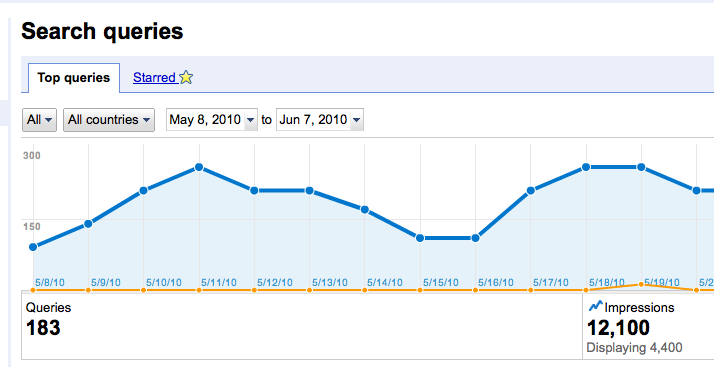 More recently, an exciting addition has come to Webmaster Tools called Search Queries. Search Queries gives users the ability to track Google searches in which their site has been displayed in the results. The tool will track the total number of these unique queries, the number of impressions in which the site has been displayed in the results, as well as the number of clicks on these impressions. The graph shown above is the search queries results of an example period for this site, showing the ability to view this information for different date ranges and locations. The image above shows another piece of information shown in the Search Queries area, which gives the user a detailed breakdown of the individual search queries for the site. 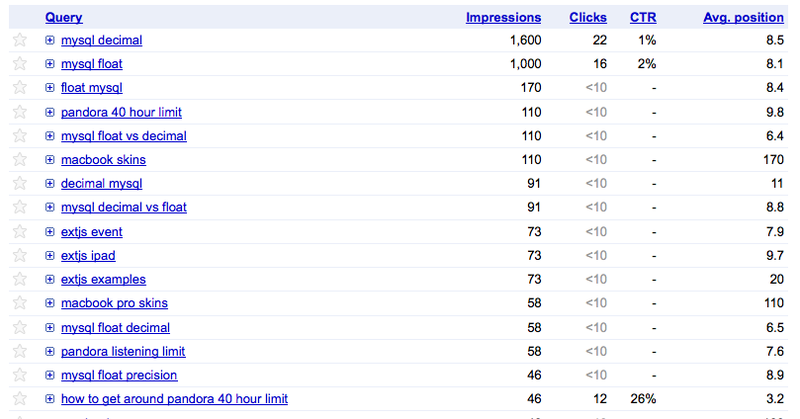 Useful information is given explaining the number of impressions, clicks, CTR, and average position for this query. The number of impressions simply shows the number of times the site has been in the result list for that query in the date range selected, while the number of clicks is the number of times out of those impressions that the site was actually clicked on by the search user. CTR is an acronym for Click Through Rate, which is just a calculation of the number of clicks divided by the number of impressions. Finally, the average position refers to the actual position of the site among all the results given for the search query. An average position less than ten generally means that on average the site showed up on the first page of results for that search query. The last screenshot given above shows a breakdown of an individual query shown in the query list for the site. The query is broken down into results given by different positions that the site has shown up in. This specific query shown has the most impressions in the “6 to 10” range, but also other impressions tracked in a few other positions. The breakdown also shows all of the pages linked to for this search query.